As we've seen over the past few years, NVIDIA isn't content with simply doing what has been done well. Certainly their graphics cards are good at what they do and competition in the market is great today delivering amazing value to consumers. But they've forged ahead with initiatives like SLI for multi-GPU rendering and CUDA for general purpose programing on GPU. Now they're taking it a step further and getting into stereoscopic 3D. To be fair, NVIDIA has supported stereoscopic 3D for a long time, but this is more of a push to get pervasive stereoscopic graphics into the consumer space. Not only will NVIDIA graphics cards support stereoscopic rendering, they will also be enhancing their driver to extract depth information and create left and right eye images for applications that do not natively produce or support stereo rendering. And did we mention they'll also be selling active wireless shutter glasses? 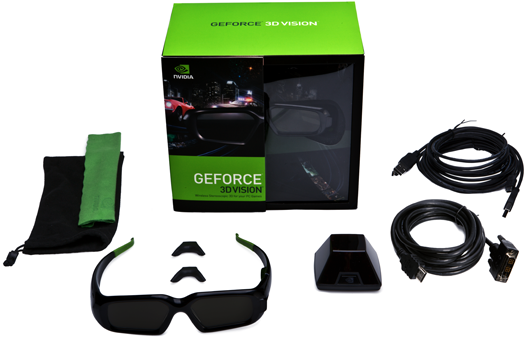 Packaged as GeForce 3D Vision, NVIDIA's shutter glasses and transmitter pair will run consumers a respectable $200. This is more expensive than some glasses and cheaper than others. We actually don't have any other glasses in house to compare them to, but the quality, freedom and battery life are quite good. If it becomes necessary, we will do a comparison with other products, but the real advantage isn't really in the hardware; it's in the driver. The package also comes with a soft bag and cloth for the glasses, alternate nose pieces, cables and converters, and a couple disks with drivers, stereoscopic photo viewer and video player. Stereoscopic 3D shutter glasses have been around since the late 90s, but with the push away from CRTs to LCDs with a fixed 60Hz refresh rate meant that high quality stereoscopic viewing on the desktop had to be put on hold (along with hopes for smaller pixels sizes, but that's a whole other rant). With Hollywood getting really interested in 3D movies and some display manufacturers getting on board with 120Hz monitors, TVs and projectors, it makes sense that we would see someone try to push this back to the forefront. Before we get into just how NVIDIA wants to make stereoscopic 3D on the desktop a reality, lets take a look at exactly what we're talking about. 1) NVIDIA is exceptional in creating Graphics rendering processing. Nvidia is not so good at developing physical Optical systems and understanding the Human Eye. These two guys sound like a great match to me. Toss in the fact that Vuzix is Rochester, NY where they have the University of Rochester institute of optics, and RIT's imagaing science center. That is a picture of the driver panel from my nVidia drivers before they dropped support for real 3D. I would love to spend $1000 on these glasses, and a new system, Vista, new video cards, and of course a new monitor to use them on. I wish, and I don't need any stereo connectors for my dual polarized LCD display. Just dual outputs (vga or dvi, or one of each).